I would rather have them wear red jerseys! Absolutely the dumbest thing ever. I just threw up in my mouth . . .
Bronco is the dumbest smart coach in college football. 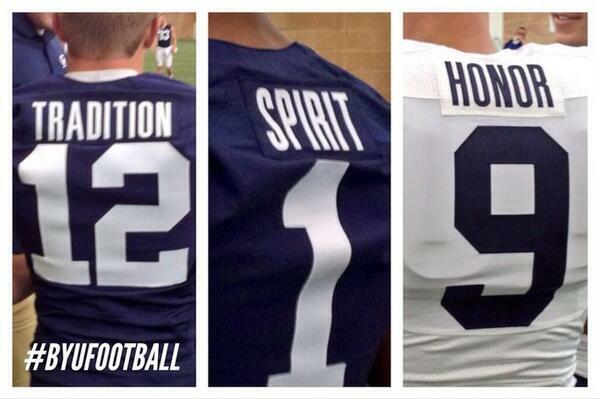 Those are all reactions I read when Bronco Mendenhall announced last Thursday (without discussing it with anyone first, apparently) that the BYU football team would, from now on (or at least for his duration as the head football coach) wear jerseys with either "Tradition", "Spirit", or "Honor" on the back instead of their last names. Chaos ensued. My reaction? Wow, that's a dumb idea. Oh well. And that's as much as I let myself get worked up about it. Apparently the Twitter world flipped out. I have a Twitter account, but I use it sparingly, so I didn't see the backlash first-hand. I just heard about it later. Now I find it quite humorous. Apparently they held a team meeting on Thursday night after the announcement. Bronco had heard some negative feedback and asked everyone to show, by a raise of hands, who wanted to wear the new jerseys. Zero hands went up. Then he asked who wanted to wear jerseys with their names on them. All the hands in the room went up. Bronco conceded and admitted that he had made a mistake. Then Kyle Van Noy suggested wearing them for one game-- Homecoming. Everyone agreed. This is one of the reasons I love BYU football. Bronco's willingness to admit that it was a dumb idea really shows a lot of guts, and it also proves that he has respect for his players. He really couldn't have handled the situation any better. And KVN's suggestion of a compromise shows his and the rest of the team's respect for Bronco; They didn't want to totally leave him in the cone of shame, so they extended an olive branch. I can't help but wonder how something like this would have gone over at any other university. Would a compromise have been reached? Would the coach have admitted he was wrong and been respectful of his players' wishes? In most cases, I doubt it. As they said on Cougar Sports Saturday this weekend, most people will probably forget a few years down the road what Bronco even wanted to put on the jerseys . . . maybe Friendship, Honor Code, Sandwiches, and Integrity? But yes, Cougar Nation is going to be talking about this for long time. Just get over it, people. Laugh and move on with your lives . . .
All I have to say is if this is the biggest scandal BYU football faces this year, we're in good shape!